Using our Influencer Network Analysis (INA) methodology, we analysed the recent media discussion around the diabetes drug market to identify the main topics and the key opinion leaders driving the conversation. The global diabetes drug market is on the rise mainly due to the increasing prevalence of the disorder: the number of adults living with diabetes has almost quadrupled since 1980 and is now 422 million, according to the World Health Organisation. This pool may rise to 642 million by 2040, as per the International Diabetes Federation’s estimates, with an expected increase in patients from emerging countries. The market would likely be valued at $58.4 billion by 2025, growing with a compound annual growth rate of 3.6% from 2016, when it was worth $43.1 billion. With its relatively low entry barriers, the market is home to a copious number of players, and the competition is anticipated to intensify further with the emergence of new rivals and the emphasis on product development by established companies. In terms of revenue share, North America leads the global market primarily because of unhealthy eating patterns and sedentary lifestyles, but this dominance is expected to be challenged by the Asia Pacific, with countries such as China and India offering considerable opportunities for market penetration. In addition to the increasing prevalence of the disease, another major factor for the development of the market is the rising global awareness of diabetes. A growing number of stakeholders have joined the media conversation, including governments and national agencies, international organisations, patients, healthcare professionals, academics, insurers and food industry representatives. We analysed the diabetes conversation in the English-language media in the last six months, using our Influencer Network Analysis (INA) methodology, which employs natural language processing, entity extraction, free-text data mining and dynamic network mapping technology, complemented by human-led analysis. The main topic was the cost of diabetes drugs, specifically in the United States, the world’s largest pharma market, where patients spend around $1,200 on prescriptions drugs a year – more than the patients in any other developed country. Drug price levels, in general, have traditionally been one of the hottest topics discussed in the US media, and for a good reason: on average, citizens of other high-income parts of the world spend 56% of what Americans pay for the exact same drug. For instance, the average US prices for the world’s 20 top-selling medicines are three times higher than in the UK. In the case of diabetes, the American Diabetes Association estimated that the total costs of diagnosed diabetes have risen to $327 billion in 2017 from $245 billion in 2012, which represents a 26% rise. The higher spending has been attributed mainly to the rising prices of insulin, the most popular diabetes medication, which has become “the poster child for pharmaceutical price gouging”. The cost of the four most popular types of insulin has tripled over the past decade. Critics from various stakeholder groups have pointed out that the value of medicines is not established in a reliable manner since US policy makers have traditionally been relying on the market to determine the prices and have not implemented relevant regulations. Some commentators refer to examples from Europe and Canada where drug prices are determined via value-based (health technology assessments, pharmacoeconomic analyses), reference-based (international and therapeutic price referencing) and risk-based (managed entry agreements) approaches. Many media outlets in our sample reported on a recent study by the nonprofit Health Care Cost Institute, which found that the cost of insulin for treating Type 1 diabetes in the US nearly doubled from 2012 to 2016. Apart from trying to explain the reasons behind the price hike, journalists often included stories from family members and patients describing the rationing of the lifesaving medication because they could not afford it. The majority of articles mentioned specific pharma companies, particularly Eli Lilly, Sanofi and Novo Nordisk, which control almost the entire $27-billion global insulin market. Reuters wrote that so far in 2019, Sanofi raised prices on some insulin products between 4.4% and 5.2%, Novo Nordisk raised prices on some of its insulins by 4.9%, while Eli Lilly had not raised prices on its insulins as of January this year. In fact, Eli Lilly was the most often mentioned company in the pricing topic because it announced plans to sell an “authorized generic” version of its most popular insulin, Humalog, for $137.35 per vial, a 50% discount off the list price. Some journalists suggested that the move was an effort to head off criticism about rising costs since Lilly is often in the centre of insulin debates: it has raised the price of Humalog more than 30 times since 1996, reaching more than a 1,000% increase. Many articles fell under both ‘drug pricing’ and ‘regulation and policy’ topics, since healthcare costs have always been on the agenda of presidents, senators and of the Congress, and are currently a major focus of the Trump administration. States and federal government agencies have usually taken an active part in the debate, with some mandating tighter drug price control and launching legal challenges against pharma companies. Some states like Connecticut, Maine, New Hampshire, Oregon and Vermont introduced transparency bills compelling drug makers to justify their pricing practices. Multiple congressional inquiries have focused on insulin, with the most widely reported news in our sample being that two US lawmakers, Democratic Representatives Frank Pallone and Diana DeGette, wrote letters to the heads of Eli Lilly, Novo Nordisk and Sanofi requesting information on why insulin costs have skyrocketed in recent years. This came after Democratic Representative Elijah Cummings wrote to 12 pharmaceutical companies, including the insulin makers, questioning their pricing practices. The ‘regulation and policy’ topic also included articles on Brexit and the possibility of insulin shortages in case the UK crashes out of the EU without a deal. Patients and providers have started stockpiling the medicine, and companies such as Novo Nordisk have booked some air-freight slots to prepare for the possibility of significant border delays, while others such as Sanofi are boosting their UK supplies and testing alternative routes into the country. These reports come as part of pharma’s central place in Brexit-related discussions. From the infamous campaign bus which hit the road with Vote Leave’s empty promise about £350 million a week for the National Health Service to the latest ominous warnings of post-Brexit shortages of drugs and medical devices, we would struggle to find an in-depth analysis of the impending political divorce which does not feature the life science sector. For more on this topic, read our analysis: Brexit in the Media 3: Life Science PR in Unhealthy Climate. Business and professional publications also focused on recent regulatory approvals in the sector. For instance, the European Commission gave the green light to AstraZeneca’s diabetes drug Forxiga for use as an oral supplement to insulin in adults with a rare type of the disease. In the meantime, the US Food and Drug Administration rejected a drug by Sanofi and Texas-based Lexicon Pharmaceuticals for use with insulin in patients with type 1 diabetes. Most recently in the ‘approvals‘ topic, Novo Nordisk submitted its oral semaglutide drug, which it hopes will transform the diabetes market, for approval in the US, using a priority review voucher to speed up the review time. Clinical trials and medical research were naturally the focus of professional outlets. Recent instances included a trial which found that an experimental drug may help type 2 diabetes patients control their blood sugar and a study which estimated the positive impact of jardiance on life expectancy in adults with type 2 diabetes. The ‘corporate strategies’ topic included reports on specific corporate initiatives: for example, EastGate Biotech, which specialises in insulin drug delivery, appointed key opinion leader Dr. Lalit Upadhyay to drive awareness of the company’s liquid insulin mouth rinse solution for Type 2 diabetes and pre-diabetes patients. Meanwhile, Insulet, s firm focusing on tubeless insulin pump technology, announced that it will raise awareness for National Diabetes Awareness Month in November. There was also a fair share of legal news, the top trending of which was the US Patent and Trademark Office rejecting Sanofi’s infringement claims against generics drugmaker Mylan relating to insulin drug Lantus, Sanofi’s leading product with sales of $5.26 billion in 2017. In the meantime, Roche launched a lawsuit claiming that its glucose test strips for diabetes patients were used in an $87 million insurance fraud scheme. Financial reports and forecasts featured Novo Nordisk reporting solid growth for its new diabetes drug and saying it would submit a tablet version for US approval in the first quarter, which lifted the company’s shares with almost 4%. Other news included diabetes drug Trulicity boosting Eli Lilly’s third-quarter profit. Eli Lilly’s lead was mainly due to the launch of Humalog’s cheaper version, which was well-documented by a wide variety of outlets and was met with mixed reactions. In addition to the context of drug pricing and its patent case against Mylan, Sanofi was mentioned for its ambitions for connected technology in diabetes – the company has pushed digital, integrated diabetes efforts through its joint venture Onduo, and with Verily and Sensile Medical. Nicolas Kressman, Sanofi’s senior media relations officer for North America, said in an interview with Fierce Pharma: “It is not just about developing a platform supporting the daily management of diabetes, it’s about a test and learn process by bringing quickly to the people the support that they need, ensuring that the adoption process is easy for them and improving solutions as time goes.” He added that the company is also working on its own and with partners on a “complete portfolio of disposable and reusable connected insulin pens”. DRG Digital’s Patient Experience Index found that Sanofi’s and Novo Nordisk’s brands rank best for digital type 2 diabetes patient experience in the highly competitive marketplace for type 2 diabetes treatments. For example, Sanofi’s Lantus website tailors content to patients according to their experience, while unbranded assets supporting Novo Nordisk’s diabetes brands include patient-centric messaging conveying to patients that they’re not alone. Novartis and Pfizer were mentioned for their joint venture to develop treatments for a liver disease which may become a lucrative market because it’s related to obesity and diabetes. Medtronic, the world’s largest medical device company, was the only medtech firm on our list. It has launched the MiniMed 670G system, a self-adjusting insulin pump system for patients who have Type 1 diabetes, in the UK. Using our INA methodology, we also found the influencers shaping the diabetes drug market discussion. In order to go beyond the well-known key policy stakeholders, we excluded politicians and top-level officials. In this way, we excluded some of the political ‘noise’, which made it easier to identify other types of influencers and to gain deeper insights into the stakeholder groups driving the debate. 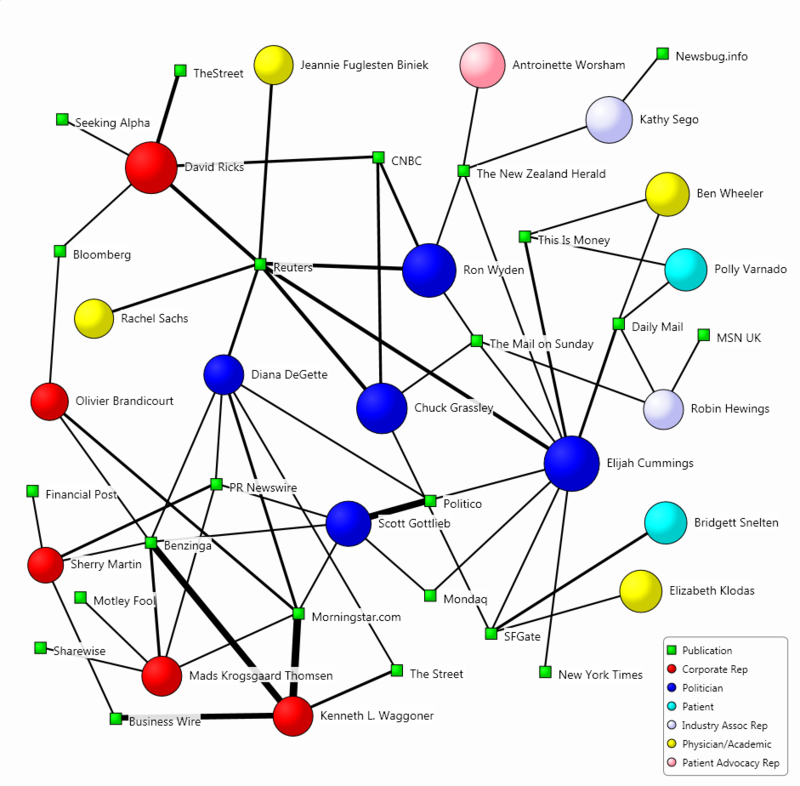 The map below visualises the relationship between the influencers driving the conversation and the publications which mentioned them most often. The size of the circles indicates the influencers’ prominence in the media discussion, and the width of the connections between the influencers and the publications is indicative of the coverage volume. In our sample of the diabetes discussion, Eli Lilly CEO David Ricks was the most central spokesperson. He was quoted by publications such as Reuters and Bloomberg mainly in relation to his company’s launch of the cheaper version of Humalog. He also wrote a blog post, which he said that his company agrees with patients, doctors and policymakers who are demanding lower list prices for medicines and lower patient costs at the pharmacy counter. Apart from Ricks, other corporate representatives were not that influential and lagged behind politicians. The other most central pharma CEO was Olivier Brandicourt, the head of Sanofi, who provided a rare look behind the curtain of drug prices, with a detailed breakdown of the company’s US sales last year, showing that of the company kept less than half of its 2018 revenue. Other corporate representatives in the media conversation included Mads Krogsgaard Thomsen, chief science officer at Novo Nordisk, who was quoted in relation to the firm submitting its oral semaglutide drug for approval in the United States. “Many people don’t like to inject themselves with a needle,” Thomsen told Reuters because having to inject the drug tended to make people feel more sick. As the US media generally presents the drug pricing discussion from a political angle, politicians, government agency representatives and government officials had a share of the conversation. Republican Senator Chuck Grassley, chairman of the Senate Finance Committee, and Senator Ron Wyden, the committee’s top Democrat, were the most influential policy makers in the discussion for sending letters to the heads of Eli Lilly Novo Nordisk and Sanofi. Physicians and academics were also well-represented in the discussion, particularly around drug pricing. Cardiologist Dr. Elizabeth Klodas was the most central one for saying that “we are in a sense entering a two-tiered system because there are individuals who can make it happen and just write a check”, while “others are not able”. The second most central academic was Dr. Ben Wheeler, a leading pediatric diabetes researcher in Australia, who was quoted in relation to an AP investigation into insulin pumps and their high number of injuries. He told the AP that the use of insulin pumps “appears safe” and is “potentially safer” than insulin injections. Patient advocacy representatives and patients were generally not that well-represented in the conversation, with the notable exceptions of those testifying at the Congress hearing. Antoinette Worsham, a mother of two insulin-dependent daughters, testified before the House Oversight Committee, and Kathy Sego, a mother of an insulin-dependent child and American Diabetes Association volunteer, appeared before the Senate Finance Committee. Our study corroborates that key opinion leaders play an increasingly important role in the pharma industry, with companies seeking deeper collaborations as part of their messaging campaigns. Identifying influencers and their relationships to particular topics in media conversations has become an essential part of ambitious outreach programmes. For example, in our award-winning work with the International Diabetes Federation (IDF), we explored the media discussion surrounding nutrition, sugar and obesity, highlighting potential partners for advocacy collaboration. We found the most prominent influencers and illustrated how they are interlinked, which allowed the IDF to become more targeted and efficient in its stakeholder outreach and overall communication strategy. As a result, the IDF managed to build strategic alliances and partnerships beyond the diabetes landscape and forge new partnerships. As part of IDF’s G7 “Call to Action” campaign, the influencers made diabetes the second most mentioned topic on Twitter in connection with the G7, although that topic was not on the agenda. For more insights on the immense value of PR measurement in pharma, take a look at our blog post outlining the results of five studies we conducted. Do you want to learn more about identifying key opinion leaders through Influencer Network Analysis? Download the 12-page white paper by Commetric and learn how Influencer Network Analysis can be used to identify and rank the KOLs that drive media coverage on Alzheimer’s disease, and the related topics that generate traction with media outlets and reporters.